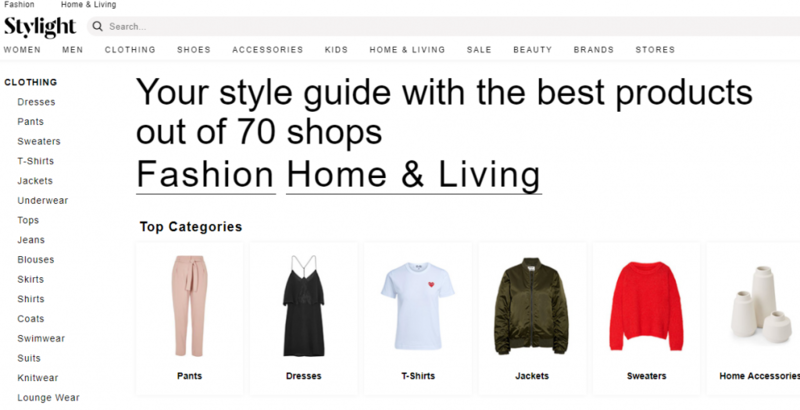 Stylight is a fashion aggregator with products from over 100 online stores. The name of the product as it appears on the website. Price of the product, using numbers and decimal points only. No currency symbols. Description of the category for the product, including gender if applicable (e.g. men – tops – shirts). Images for the product. If more than one image used, separate the URL by ‘|’. Images must be at least 500 x 500 pixels. Alpha-numeric voucher code, if voucher code is provided. The type of reduction/code, if voucher code is provided. The value of the reduction, if voucher code provided. Minimum order value, if any, if voucher code provided. Manufacturer’s suggested retail price for the product, using numbers and decimal points only. No currency symbols. What currency the price is listed in, using letters (e.g. USD, EUR, GBP). Whether the product is mens, womens, boys, girls, or unisex. The product photo used should match this field. If no gender field is included, the category field should include information on gender. Which materials used, and % breakdown if possible (e.g. 95% cotton, 5% elastane). If this field is not included, materials should be detailed in the description field. In cases of muliple colors, start with the most dominant color and separate each color with ‘|’. e.g. striped, polka dot, etc. e.g. casual, gothic, 60s, etc. e.g. sports, party, formal, etc. What formats does Stylight accept? The preferred format is CSV but XML is also accepted. How to send your feed to Stylight ? The best coding to use for the feed is ISO88591, although UTF-8 is also fine. If you need help with creating a Stylight feed, feel free to reach out to us below.